Scale the Head board (A), Footboard (B), Left Stiles (C), Right Stiles (D), Top Side Rails (E), Bases (J), and End Posts (K) to the drawing dimension sizes. This can be accomplished by measuring the length of the headboard (A) on the print out with a ruler and dividing those sizes into the dimensions on the drawings. Be very precise with your measurement. This will give a multi-factor that can be used to figure the enlargement sizes for all the patterns. This multi-factor should be approximately 8.77. This can be easily done at home if you have a printer capable of making enlargements. If not, most companies that do duplicating can make the enlargements required for the patterns. Trace each pattern onto poster board or Mylar and carefully cut out the patterns with a pair of scissors. Finally, trace the patterns onto the wood. Use ¾” thick lumber for cradle and 1”thick lumber for the end posts (K). Use 1 ¼” thick lumber for the bases (J). Use a radial arm saw to cut all lumber to the proper lengths, and a table saw to rip all lumber to the proper widths. Use a jointer to remove all saw marks on the lumber caused by the ripping procedures. Dowel two 10 ½” x 19” boards together to make the headboard (A). This can be accomplished by placing the edges together and making marks for the dowel pin placements. These marks should be 2 ½” from each end and one in the middle. Clamp a dowel jig onto the boards and align the 3/8” hole with the marks. Drill 3/8” diameter holes 1 1/8” in deep into the edge of each board at the marks. Place wood glue on the edges and in the holes of each board and clamp them together with bar clamps. Repeat steps #5 through #7 to make the footboard (B). Also glue and clamp the two 1 ¼” boards face to face to make the bases (J). Allow the glue to dry over night. Remove the clamps and use a planer to trim the faces of each board. Turn the boards over and trim the other sides. Trace the patterns (A), (B),(C), (D), (E), (J), and (K) onto the lumber and use a band saw to cut out the head board, footboard, left stiles, right stiles, top side rails, bases, and the end posts. Use a spindle sander to sand the curved portions of the headboard (A), footboard (B), stiles (C) & (D), top side rails (E), bases (J), and the end posts (K). Use a router with a 1 1/16” Roman ogee bit to route the curved outer edges of the stiles (C) & (D) and the top side rails (E). Measure 4 5/8” from one end of each top side rail (E) and each bottom side rail (F). This will be the center for the first spindle (I). Measure 2 ¼” more to locate the centers for the second spindle. Repeat the 2 ¼” measurements to locate centers for the remaining 10 spindles. It will require 8-redwood dowel rods to make the 24 spindles. The dowel rods should be 3/8” D. x 36”. Use a band saw to cut three 11” long spindles (I) from each dowel rod. Use a disk sander to slightly bevel both ends of each spindle. This will make the assembly much easier. Clamp a dowel jig to the bottom edge of the top side rails (E) and the top edge of the bottom side rails (F). Align the ¼” hole of the jig with center of the first spindle and drill a ¼” diameter hole, 1/18” deep. Drill the other spindle holes into the top and bottom side rails. Attach a dado head onto the table saw. Adjust the height to cut 3/8”. Use a table saw with the miter gauge to cut rabbet joints on the outer surfaces of the left and right stiles (C) and (D). The rabbet joints for the top ends of the stiles should be 3/8” x 2 3/16” x 1 916”. The rabbet joints for the bottom ends of the stile should be 3/8” x 2 3/16” x 1 15/16. Also cut rabbet joints on the ends of the inner surfaces of the top side rails (E) and the bottom side rails (F). The rabbet joints for the top side rails should be 3/8” x 1 9/16” x 2 ¼”. The rabbet joints for the bottom side rails should be 3/8” x 1 15/16” x 2 ¼”. Use a mortise machine to cut a mortise ½” x 4” x 13/16” in the top center of each base (J). Use a table saw with a miter gauge to cut a tenon at the bottom of each end post (K). The tenons should be cut ¼” x ¾” on each face of the end posts and ½” x ¾” on each edge of the end posts. Chamfer the corners of each tenon slightly with a disk sander. This will make the assembly much easier. These tenons should fit snugly into the mortises of the bases discussed in #18. Use a table saw to cut the stretcher (H) to its proper dimensions. On each end of the stretcher measure 3/8” from each edge and mark the centers for the dowel pins. Align the 1/” hole of a dowel jig with the 3/8” marks and drill four ¼” diameter holes 9/16” deep in the ends of the stretcher. Place wood glue in the holes and tap a ¼” x 1” dowel pin (L) into each hole. To locate the dowel holes for the end posts (K) measure over 2 ½” from the edge on the inside face of each end post and draw line approximately 6” long. From the bottom end of each end post make marks 4 7/8” and 5 5/8” on the 6” line. Use a drill press and a ¼” Forstner bit to drill dowel holes 3/8” deep. Locate the center for the hinge pin assembly (V) at the top portion of the end posts (K), headboard (A), and footboard (B). Use a drill press and a 1” Forstner bit to drill holes for the hinge pins (M). Locate the center for the stop pen assembly (W) 15 ¾” down from the top of the end posts (K), headboard (A), and footboard (B). Use a drill press and a 5/16” Forstner bit to drill holes for the stop pin (P). Finish sand all parts with and orbital sander and 220 grit sandpaper. Hand-sand all corners, sharp edges slightly with 220 grit sandpaper. Hand-sand all irregular shapes in places where the spindle sander was unable to sand. Place wood glue in the spindle holes of the bottom side rails (F) and use a wooden mallet to tap the spindles (I) into place. Place the top side rails (E) in place and insert the spindles into the holes. Place the stiles (C) and (D) in place with the top and bottom side rails (E) and (F) to form lap joints. Be sure to use wood glue on the joints and then use four bar clamps to exert pressure until the top and bottom side rails are clamped tight to the stiles. Square each cradle side assembly with a framing square and then use hand screw clamps to secure each lap joint. Allow the glue joints to dry over night. Glue and nail the side assemblies onto the head and footboards (A) and (B). Use a nail gun with 1 ½” nails. Glue and nail the bottom (G) flush with the bottoms of the side assemblies and the head and footboards. Apply glue on the tenons of the end posts (K) and in the mortises of the bases (J). Insert the end posts into the bases. Use a wooden mallet to tap the bottom of the bases to insure a tight fit. Attach the end posts (K) to the stretcher (H) by applying glue on the dowel pins (L) and in the dowel holes in the end posts. Use a bar clamp to secure the parts and allow the glue to dry over night. Use a framing square to make sure that the end posts are square with the stretcher. Be sure to clean up excess glue immediately with a damp cotton rag after each glue procedure. If the glue soaks into the wood it will prevent stains and finishes from penetrating and ruin the finish job. Use plastic wood dough to fill the nail holes. Allow the wood dough to dry completely. When dry sand flush with a sanding block and 220 grit sandpaper. Remove all sanding dust from the cradle. First, use compressed air and then use a tack rag. If stain is desired, apply with a brush and allow it to penetrate approximately 10 minutes. Then remove excess stain with a clean cotton rag. Allow the stain to dry over night. If necessary, repeat steps #3 and #4 for a second coat of stain. Apply a clear coat of lacquer or Polyurethane with a pure-bristle brush, and allow the finish to dry over night. Lightly hand-sand the finish with 220 grit sandpaper. Remove sanding dust with a tack rag. Apply a second coat of finish and allow the finish to dry over night. If additional finish coats are desired, repeat steps #6 through #8. After the final finish coat allow the project to dry for 24 hours. Be sure to use a tack rag after each sanding procedure to remove the dust. Match the color of the wood dough with the color of the wood or the stain. Do not allow the stain to dry before attempting to remove the excess with a rag. Use a metal lathe to turn the hinge pins (M), hinge pin collars (N), spacers (O), stop pin (P), and the stop pin plate (S) according to the dimensions on the drawings. The inside diameter of the spacers should be drilled 1 1/64” diameter so they will fit over the hinge pins..
Use a hack saw to cut the stop pin collar. Fillet each edge with a file until smooth. Drill a 5/16” diameter hole in the center of the stop pin collar (R) and the stop pin plate (S). Drill two 1/8” diameter holes in the stop pin collar and the stop pin plate for the wood screws. Use a slightly larger drill bit to enlarge and taper the screw holes in collar and plate so that the #4 x ½” flat head wood screws will fit flush the top surfaces. Tap a 10-32 x ¾” thread in the center of the end of the hinge pins (M). Drill a 5/32” diameter hole in the center of the hinge pin collars (N). Enlarge and taper screw hole to accommodate the head of the machine screws so that they fit flush with the surface of the collars. Cut a groove in the stop pin shaft to fit a ¼” e-ring. This groove should be .025” wide and the diameter should be .207”. The groove should be 1/8” from the end of the stop pin shaft. Buff and polish all metal edges to remove burrs and rough surfaces. Spray all brass hardware with lacquer to retain the luster and prevent corrosion. If you do not have access to a metal lathe, any machine shop can manufacture the brass hardware for you. The brass machine screws and wood screws as well as the e-ring can be purchased at a hardware store. If you cannot find a machine shop to manufacture the brass hardware, a 1” birch dowel rod could be substituted for the hinge pins and a ¼” dowel rod could be substituted for the stop pin. The dowel hinges should be glued in place. The e-ring could still be used on the wooden stop pin. Use wood screws (U) to attach the stop pin collar (R) onto the outside of the end post (K). Use the other wood screws to attach the stop pin plate (S) to the inside of the end post. Be sure to properly align the center holes of the stop pin collar and the stop pin plate with the hole drilled in the end post. Insert a hinge pin (M) through the hole in the end post (K), then slip a spacer (O) onto the hinge pin and push the hinge pin through the hole in the headboard (A). Repeat the process for the opposite side. The hinge pins and spacers can be inserted simultaneously with two people. Position the hinge pin collars (N) in place and secure them to the hinge pins with the machine screws (T). Slip the stop pin (P) through the collar on the end post. Clip the e-ring (Q) onto the groove of the stop pin. Pull the stop out when you want to swing the cradle. 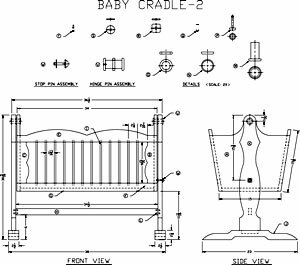 Push the stop pin in to lock the cradle. The e- ring will prevent the stop pin from being pulled all the way out. 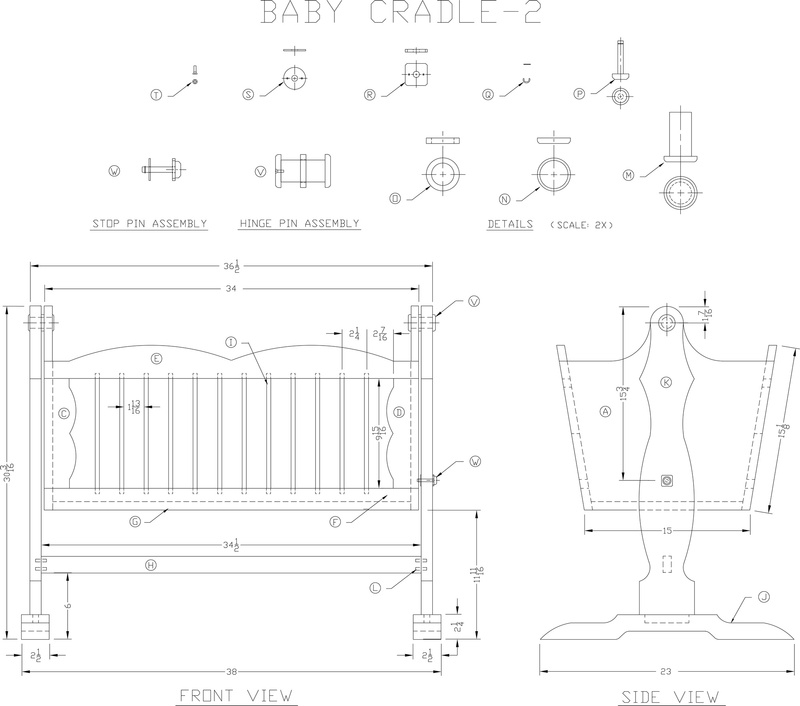 *Congratulations, your Modified Wooden Baby Cradle is finished and ready to use!